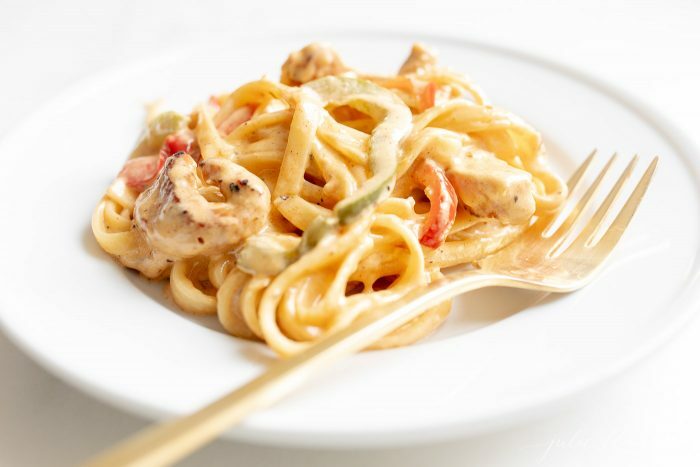 This Creamy Chicken Pasta is perfectly spicy, in a parmesan Cajun Sauce to die for! 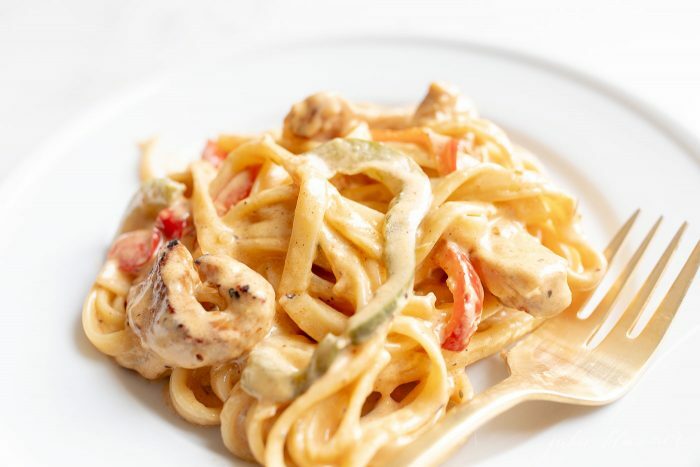 Delicious and effortless, it’s a Creamy Cajun Chicken Pasta to crave. As you know, my love for pasta is endless and ever-lasting. It’s my favorite comfort food and I don’t think there’s any pasta that I don’t enjoy. That said, occasionally I like to really spice things up. 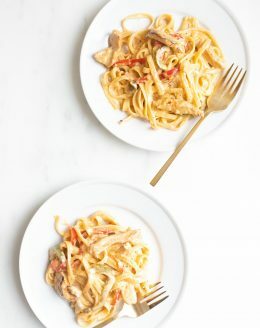 Adding some zesty cajun flavor to my favorite Creamy Chicken Pasta Recipe really kicked it up a notch (or 12)! 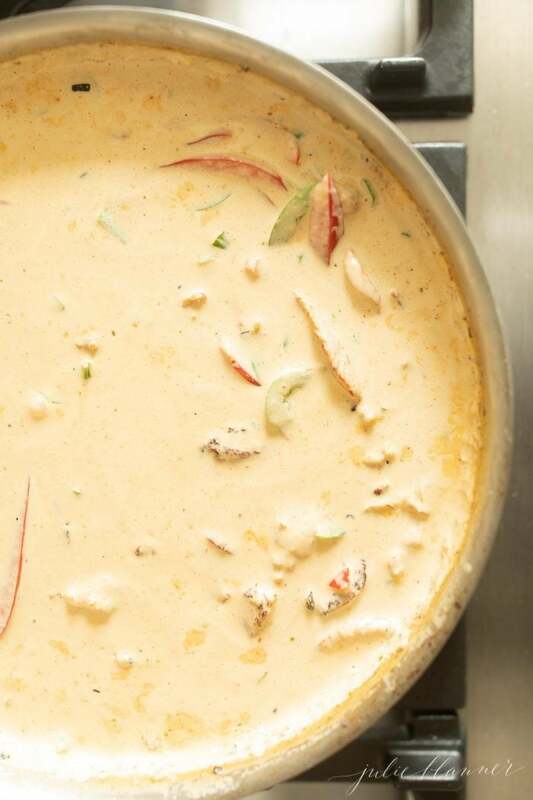 This is an easy, flavorful take on a Cajun Cream Sauce that we can’t get enough of. 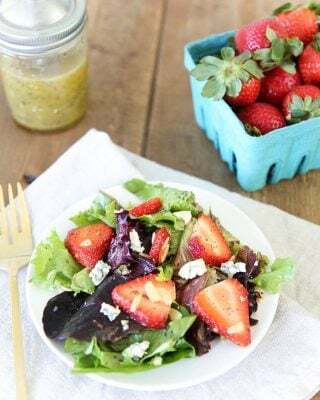 While it’s perfect for any day of the week, this feels like a Friday night dinner to me… pour yourself a glass of wine and let’s eat! 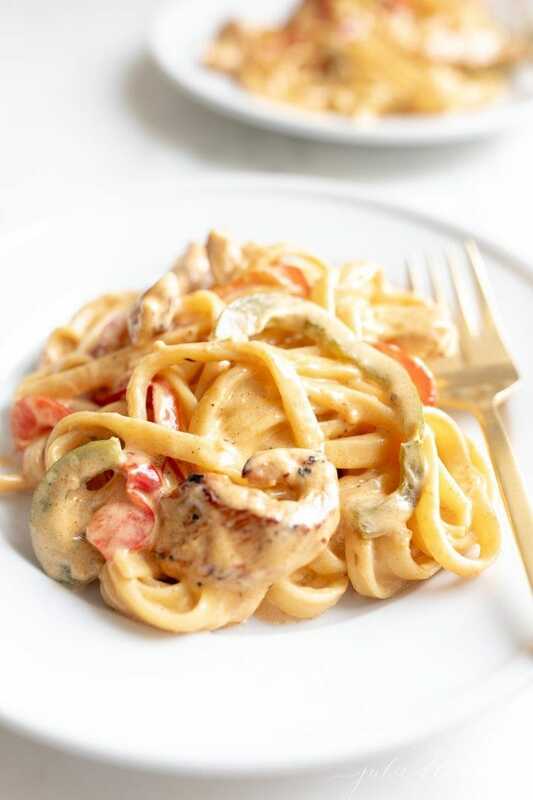 There’s so much to love about this creamy chicken pasta sauce. 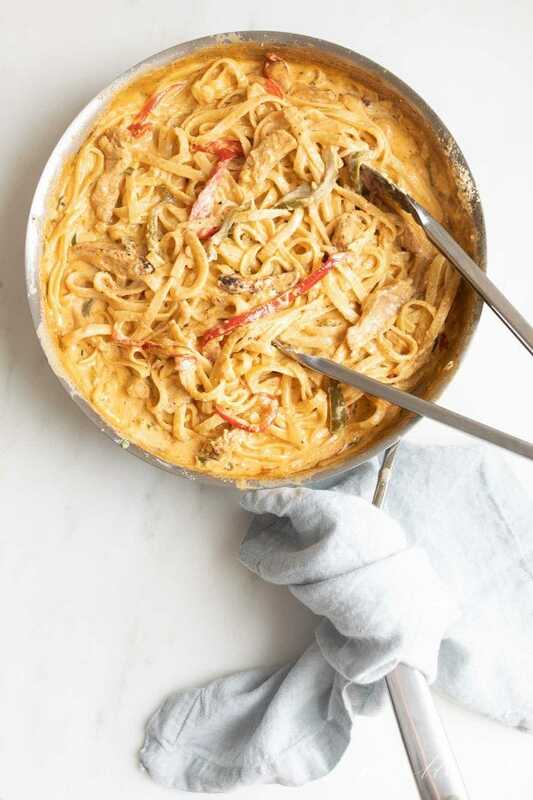 The spicy kick from the cajun seasoning is perfectly balanced by the creamy fresh-grated parmesan cheese. 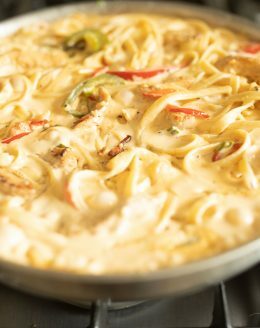 It’s a creamy chicken pasta dish you’ll truly enjoy, especially if you love a little hot and peppery kick every now and again! 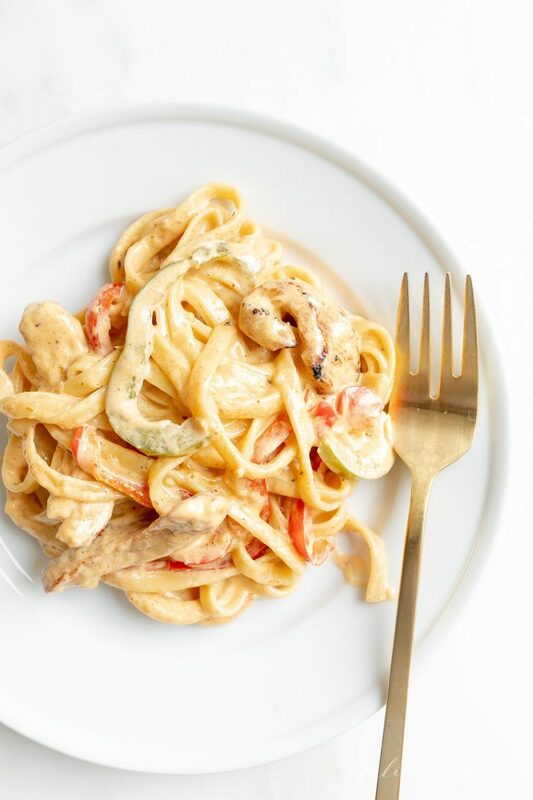 Cajun cream sauce is the perfect pasta accompaniment. 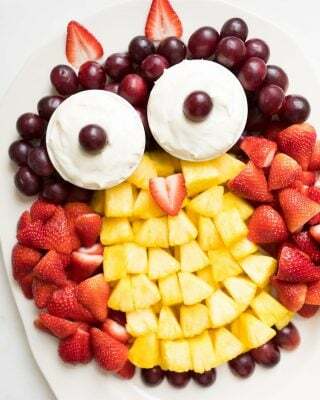 Even better, it’s so easy to customize this dish. 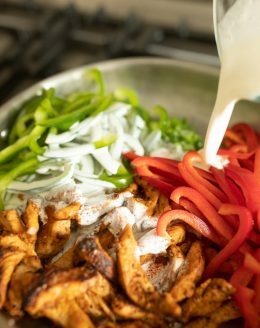 I love to serve it with my spicy cajun chicken tenders, but there’s a lot of flexibility here. If you prefer a different protein, chicken sausage or even shrimp will work beautifully. While I added bell peppers and mushrooms, you can also add fresh diced tomatoes, onions, snap peas, asparagus, or even squash. I love that you can adjust according to what’s available seasonally! As always, it’s best to start with freshly grated parmesan cheese. You won’t regret it, I promise! It’s a few extra minutes of effort for an out-of-this-world texture and flavor. Fresh grated cheese is my favorite secret for creating a creamy, textural blend in all of my recipes. However, I won’t judge you if you’ve got a green can in your fridge, any will do. I fully support shortcuts when it comes to dinnertime, but fresh grated parmesan cheese? 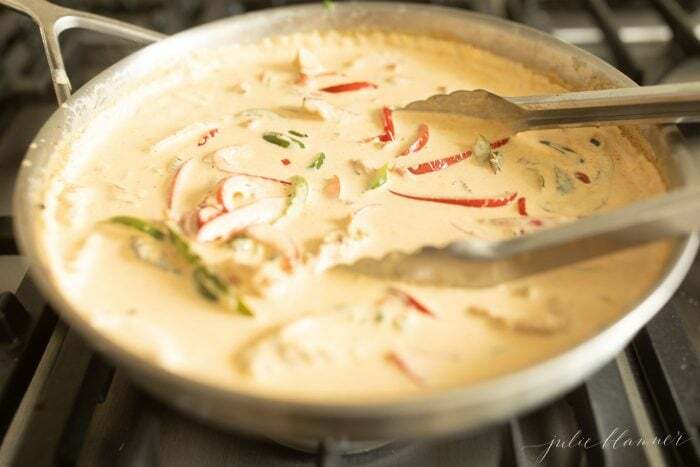 Nothing beats it, especially in this cajun cream sauce! Another must-have? Your favorite cajun seasoning! 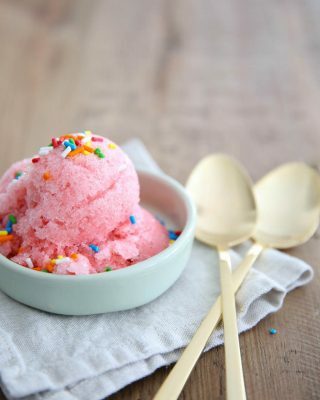 You can certainly buy your favorite (I like this one) but it’s so easy to make your own. 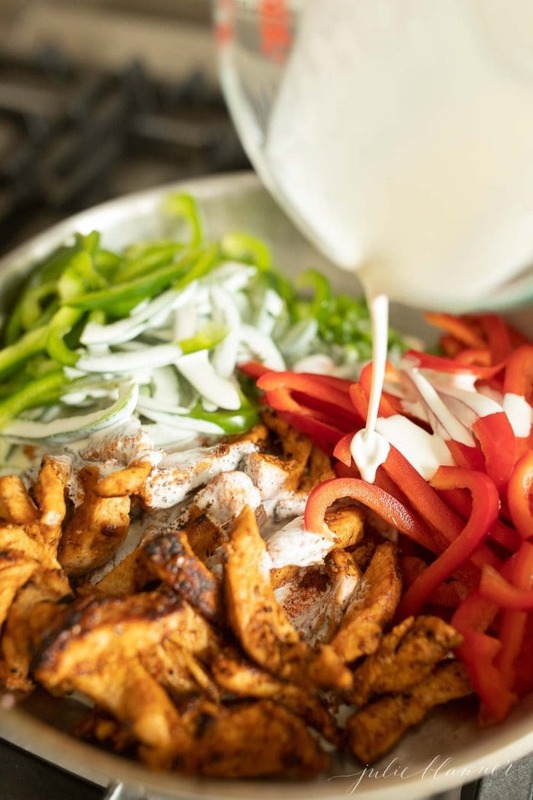 My friend Ali at Gimme Some Oven has a great Cajun seasoning mix you’ll love. 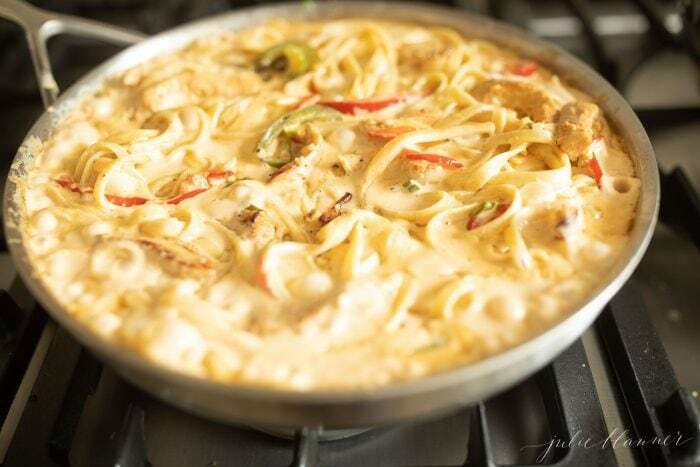 I have been dreaming up this cajun creamy chicken pasta recipe for a while now. A lot of testing goes into my recipes and as they say, practice makes perfect. I made a few tweaks along the way. One of them is that I decided to sauté the peppers before adding them into the cajun sauce to keep them tender. Also, if you prefer, you can coat them in olive oil and cajun seasoning using my Baked Chicken Breast method. Then slice or dice the chicken into cubes. First, bring a large pot of water to a boil. Sauté cajun chicken in spices and olive oil. Set it aside. 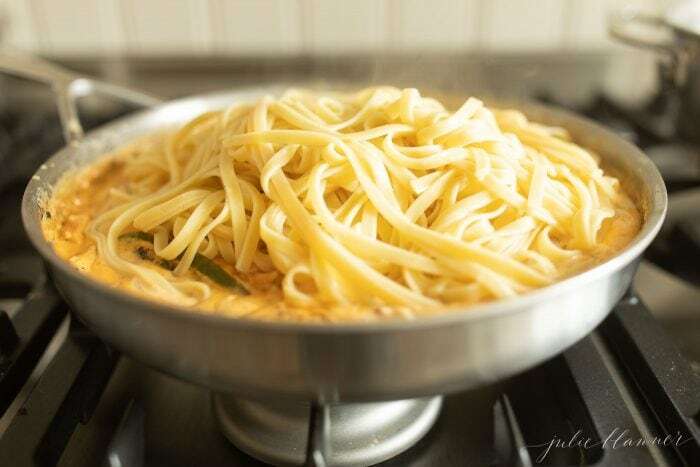 Cook your pasta according to package directions (save a little of the pasta water in case you want to thin the sauce). Or, even better, make my homemade egg noodles. 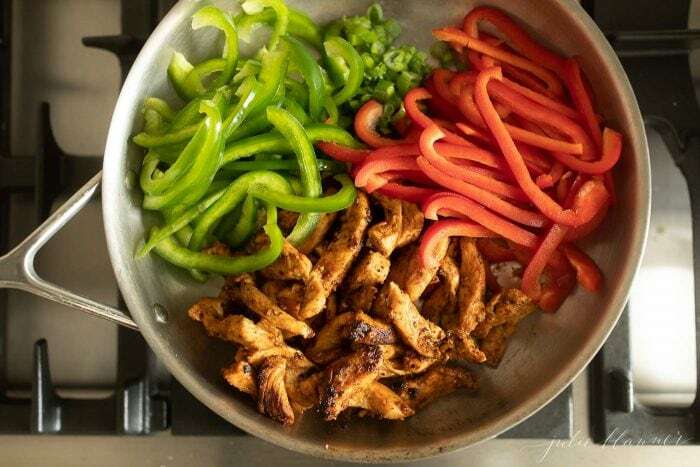 Sauté your peppers over medium heat with a little olive oil. 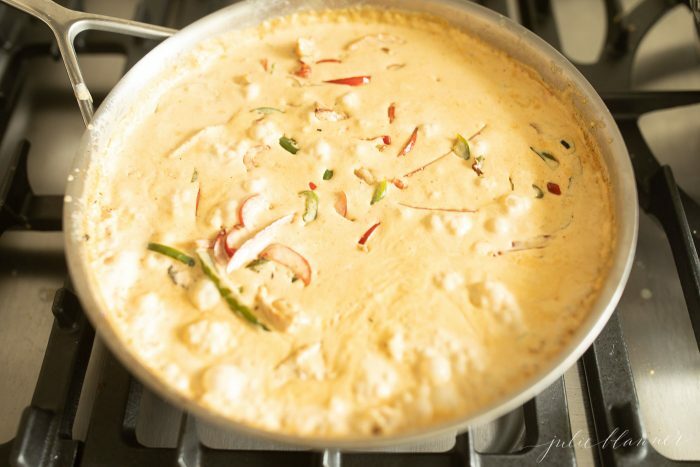 Once they begin to soften, add garlic, green onions, cajun seasoning and heavy cream. 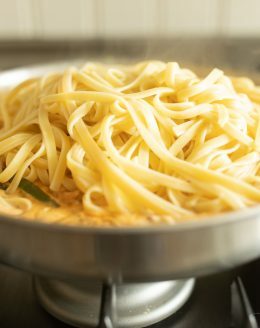 Reduce heat to low and toss with fresh cooked pasta. Remove from heat. Immediately add parmesan, tossing with tongs until incorporated. 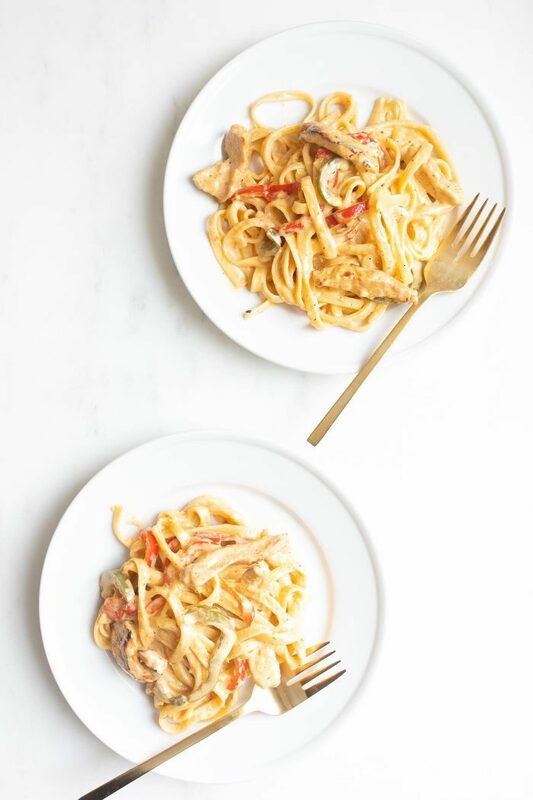 This simple and delicious creamy chicken pasta is on the table in 30 minutes! Even if you make your pasta from scratch, it’s a minimal time investment for a delicious pasta dinner that feels so special. Yes, my love for pasta runs deep. 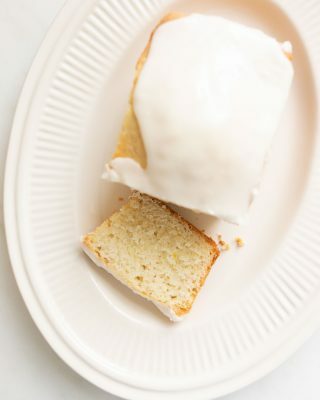 It’s one of my favorite foods and I just can’t get enough! You can find the pasta category here, but I think the following dishes will appeal to you as well. What’s your family’s favorite way to eat pasta? I hope you love it as much as we do! 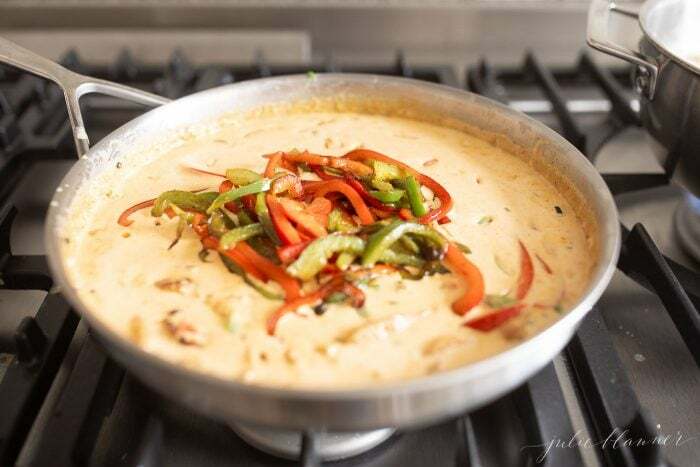 If you try this Cajun cream sauce recipe, please come back to leave a review! I’d love to hear what you think! 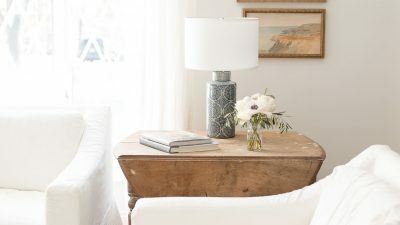 You can also share on Pinterest, or my Facebook share group, Celebrating Simple. 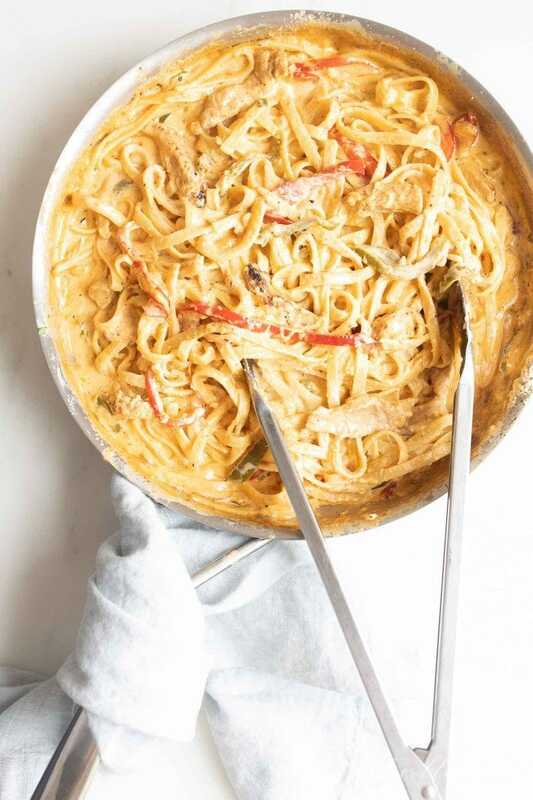 This Creamy Chicken Pasta is perfectly spicy, in a parmesan Cajun Sauce to die for! 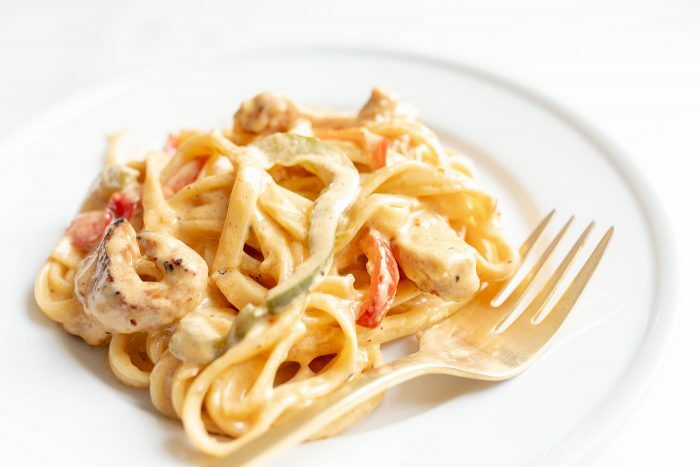 Delicious and effortless, it's a Creamy Cajun Chicken Pasta to crave. 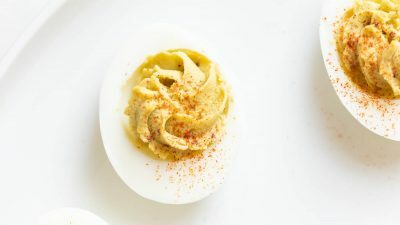 Add olive oil to a plate or shallow bowl and cajun seasoning to a plate or solid bowl. Dip chicken breast into oil followed by cajun seasoning and transfer to a cast iron skillet over medium heat. Blacken chicken 3 minutes and flip. Cook chicken 3 minutes or until done. Set aside. Cook your pasta according to package directions (I like to save a little of the pasta water just in case the sauce needs thinned). 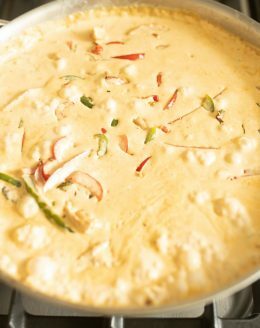 Once they are tender, add garlic, green onions, cajun seasoning and heavy cream. Bring sauce to a boil until bubbles form in the center. 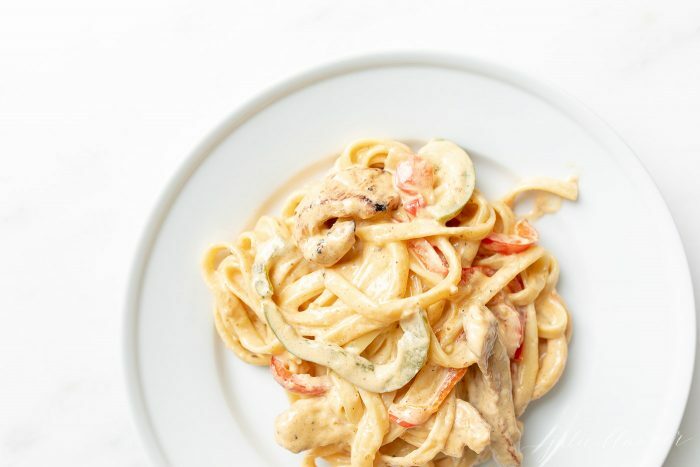 Toss the fresh cooked pasta into the cajun sauce with the chicken. Remove from heat and immediately add parmesan cheese. Toss until coated. Sauté your vegetables first or cook them with the sauce - your choice. Sautéing them makes them really tender, but does consume a few additional minutes. We made this last night. Wow! My hubby LOVED this spicy pasta! Even I enjoyed it and I don’t like spicy food. The heat was just right!